The comparison of annual returns shows terrific returns for the Basic and Plus version compared to the individual Thrift Savings Plan funds (G, F, C, S & I). The chart shows the annual return from 2005 through 2014 and the compound annual return. Under each yearly return is the volatility expressed as the standard deviation of the monthly returns during that year. 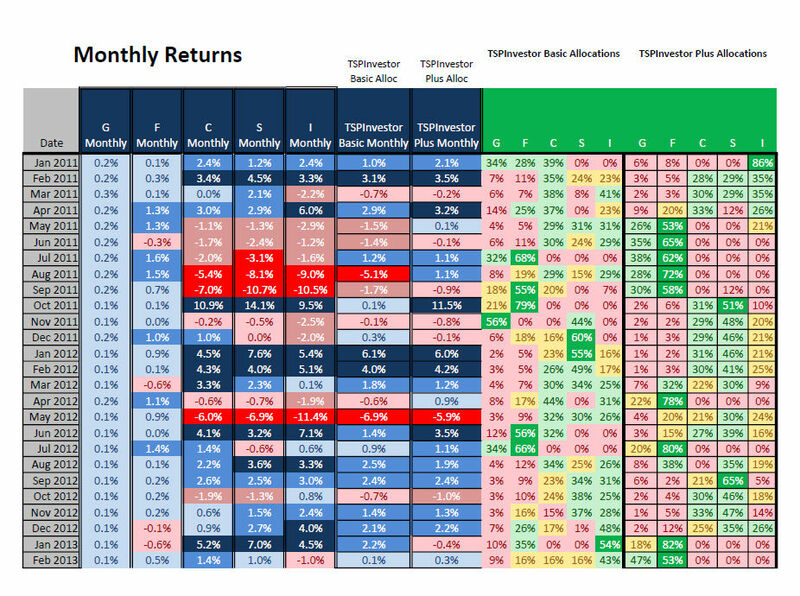 The returns of the TSPinvestor Basic and Plus show the 10 year compound (2005-2014) rates of 12.1% and 19.2%, respectively. These are impressive rates by themselves – and certainly in comparison to the individual TSP fund returns, they are solid investment strategies. When breaking down individual years, there are two years where the Basic and Plus out gained the other funds by large margins – 2008 and 2009. These two years contained a large depression and a moderate rebound. This shows that the Basic and Plus avoided the large losses in 2008. And they also took advantage of the rebound gains in 2009. In 2013 when the market gains were large in the stock market, the Basic and Plus did not match the large gains, but were still respectable. The volatility values for the Basic and Plus are significantly less that the C, S and I funds when comparing them year to year against the TSP funds. For example, in 2009, when the market was in a rebound, the stocks generally gained around 30% for the year, with a volatility of about 7%. 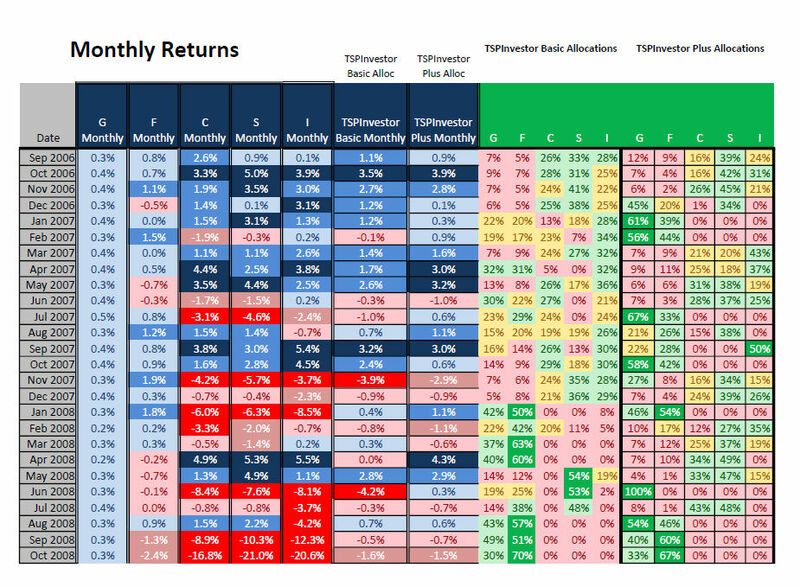 So they gained an average of 2.5% per month and so 68% of the gains were between -5.5% and 9.5% – quite a spread of returns and a month-to-month basis. 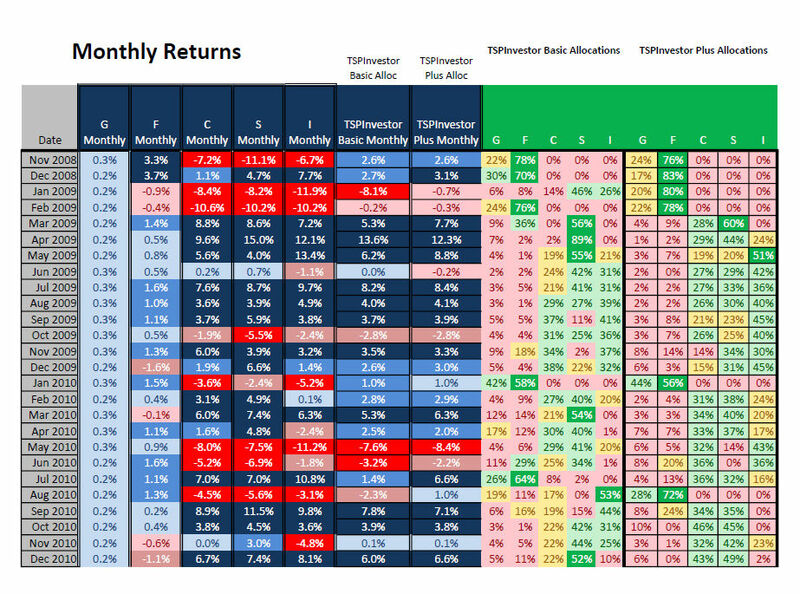 By contrast, the TSPinvestor Plus returned 57.9% for 2009, which means the monthly average was about 4.8%. The volatility was 4.4% – which means 68% of the monthly returns fell between 0.4% and 9.2%. So essentially the Plus had very little monthly losses while still getting the monthly gains. This assertion can be seen by looking at the monthly data. 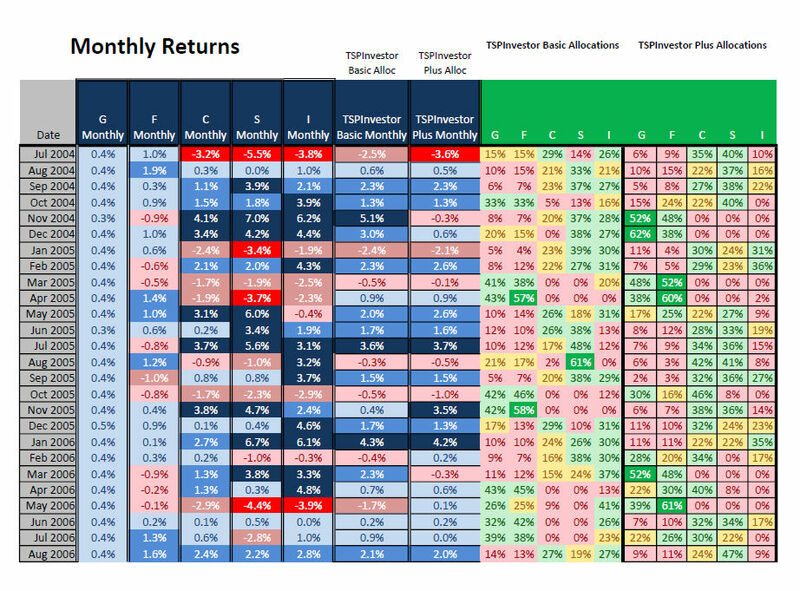 In looking at the performance of the TSPInvestor Basic and Plus allocations, a month-to-month comparison of these alongside the returns of the individual Thrift Savings Plan G, F, C, S and I funds is useful. The chart of these is included below. This information presumes that the Allocations for Basic and Plus were implemented at the start of the month and what the returns were at the end of the month for all the funds. The formulas for Basic and Plus were derived using the historical data from January 2003 through September 2015. And the data here is using that same data to “relive” history. There is confidence this will work for future investing – however the detractors would say that the past is no indication of future performance in the stock and investing world. We will see. The answer is yes – emphatically. The first attempt yielded a 10-year, 2005-2014 annual rate of 12% and the second attempt yielded 18%. Maybe a little history is needed – I have been a federal employee for 30+ years and been contributing to TSP for about that long. My long term strategy has been to invest in stocks to maximize returns. In the days before the S and I fund, I had 70 in C fund and the rest in F and G. After S and I came into existence I had 80% in the C, S and I. 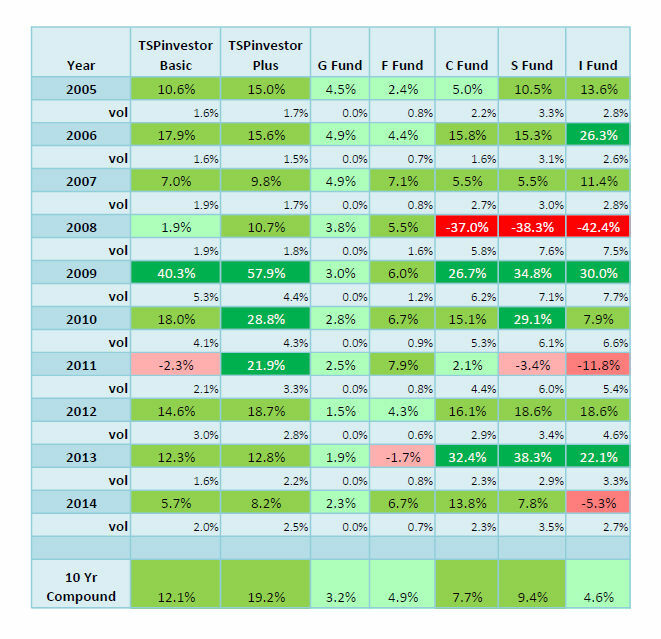 This worked well through the years and the only adjustment was to re-allocate every year or so to keep the percentages in each fund matching what I intended. I am an engineer by trade – logical and broadly educated to solve real world problems. So I used my dusty engineering/mathematical tools to tackle the answer to my question. I applied regression analysis to the previous G, F, C, S and I funds and adjusted the model/formulas to best predict next month’s fund value. I used some judgement to get the formula (the Basic). I eventually tried to improve it by adding economic factors (the Plus). I will explain my methodology, testing and results with all too much detail in another article. 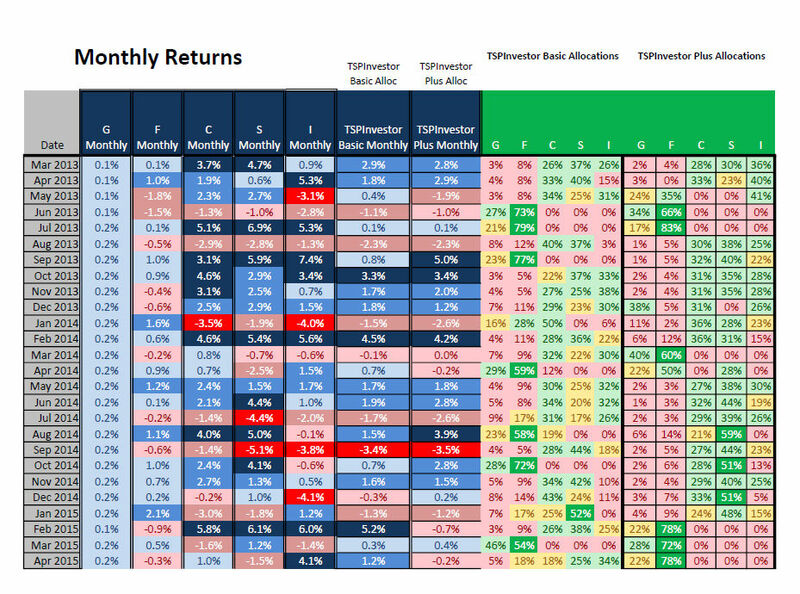 But, to be clear, the monthly allocation recommendations (the Basic and Plus) are all mathematical. There is no part that relies on my judgement for the month-to-month allocations. So, I will be posting TSP allocation recommendations to memorialize it as I prove, or disprove my allocation formulas. There will be two recommendations TSPinvestor Basic, and TSPinvestor Plus. The TSPinvestor Basic is a nominal 12% return that relies on historical fund data. It will be released no later than the first of the month. The TSPinvestor Plus is a nominal 18% return that relies on historical fund and economic data and will be released after around the 9th of the month.